Last year, Mexican filmmaker Alfonso Cuarón won audiences with what critics cite as his most personal film to date. Taking influences from his childhood, Roma is a far cry from his previous works such as Children of Men and Gravity. With no famous stars and a black-and-white appearance, it looks like Roma sees Cuarón adopting a back-to-basics approach. However, does it work on the small screen? 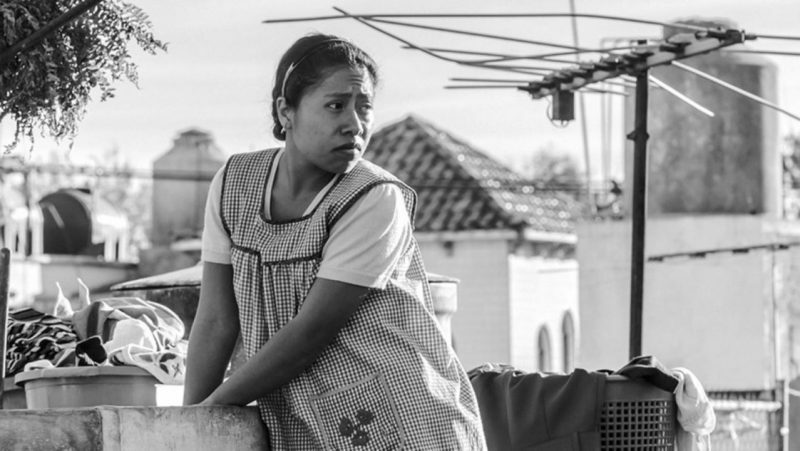 Roma stars Yalitza Aparicio as Cleo, a live-in maid living with a middle-class family in the Colonia Roma area of Mexico City. On the face of it, she is integral to the household: doing chores, taking care of the children and tending to the family’s needs without question. While Cuarón drops the odd contrast in class and cultures between Cleo and the family, it soon becomes apparent that her role is more than a lowly servant – she is a bystander, a guide for audiences. As screenwriter, director and cinematographer, Cuarón cleverly hints that there is more to this tale than Cleo. The fleeting moments of the unsettled marriage between her employers, as well as political unrest in the city, spark intrigue and draw attention to the Mexican culture and historical events (in particular, the 1971 Corpus Christi massacre). All the while, Cleo is in the foreground and the consistent focus of the film. Although she has no formal training, Aparicio is perfect in the role as the meek Cleo. Her delivery is natural and effective, allowing her presence to carry audiences through her character’s trials and tribulations. Her emotiveness brews slowly throughout the film, culminating in a dramatic hospital scene that is as heartwrenching as it is incredibly engrossing. With technical masterpieces such as Children of Men and Gravity under his belt, Cuarón’s latest feature keeps it simple. Featuring minimal dialogue, his cohesive direction allows the viewer to absorb every little detail without being overwhelmed. In addition, the fluidity of his cinematography shows a unique technical ability behind the camera. The focus on continuous shots also highlight the audience’s POV as a bystander, not to mention the naturalness of not only the film but also its settings. Roma may be seen as a Netflix film, but it is easily Cuarón’s best feature by far. By paying homage to his childhood, he has created a simple yet jaw-droppingly beautiful film that can only be seen as one thing: a visual masterpiece.